After long time of thinking, decided to sign up at Behance Network. With Behance, people can showcase their design and development work and portfolio. Almost all professional designers, developers, and people related to Web Design Community can be found on Behance. After having a look at Facebook Redesign Concept by Fred on Behance Network, I dugg the whole site for inspiration and looking at the design trends. I must say, the guys over at Behance are professional at their work, whether it is Illustrator, a Photographer or related to Art Direction. 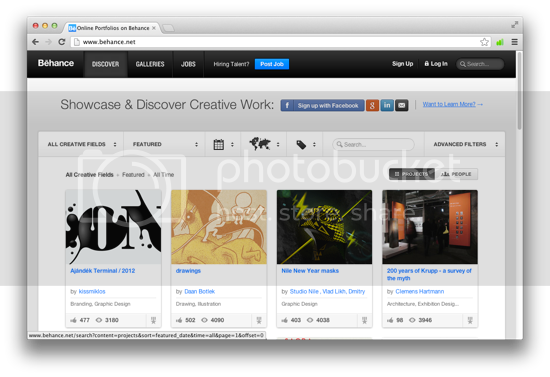 Behance is great source for those who don’t want to spend time making their portfolios on WordPress,Drupal or Joomla. Setting up portfolios is pretty easy but takes much time in installation, mostly wordpress and then for looking up portfolio themes or create one, and then setup portfolio items. Behance make it super easy. One more Behance’s feature which is well appreciated is that you are provided with the basic analytics, like who saw your profile, pageviews of your portfolio items etc. Its one of those thing that make people to sign up at Behance. There are dozens of people their, if you want to get started well, you should follow reputed and giants of your industry. If you are a Graphic Designer, this is a list of 10 people you should look ahead to follow on Behance, because these 10 peoples has amazing fan-following as well as they do have the quality in their portfolio. They will surely stand as a source of inspiration for you. I am an independent art director, illustrator and designer as well as co-founder of the trio Dopludό Collective. I’m totally involved in today’s global cultural environment which allows him to feel free in his inner search for new angles and perspectives while completing creative tasks. Roger Oddone is currently working as a Senior Graphic Designer in the Art Department at Google in Mountain View, CA. atelier olschinsky, founded in 2002 is a small creative studio based in Vienna, Austria. Based in Singapore, Anonymous is a multidisciplinary studio. Jessica Walsh is a multidisciplinary designer living and working in NYC. Her work has been featured in numerous magazines and books, and won design awards from the Type Directors Club, Art Directors Club, SPD, Print, Graphics, among others. All of these are Graphic Designers, awarded for their work. Their portfolio is full of amazing work. Jason Little, in an interview said if he is not in his office working, he find himself talking on Design with anyone. This shows how these guys are focused and serious on their work. There are so many incredibly creative people at Behance that you can just spend the whole day browsing through their awesome content and just bang your head to the table because you may not get to their level of excellence. My personal favorite there is Murat Palta and his interpretation of classic movie in miniature style. Thanks for this list. You shared a great information with us. I agree with sophia. You give a great information. Nice post, was good to read. This list will be help full to find the best.